There were a lot of 3D printer manufacturers on hand at the Inside 3D Printing Conference and Expo New York, some familiar and some not so familiar. As I reported on in July, among the many 3D printer manufacturers in South Korea only one had managed to reach US shores and that was HyVision with their Cubicon Single 3D Printer, sold through iMakr NY. Well, a new player from South Korea has entered the US market with an exciting range of 3D printers and filaments. That company is Rokit and they produce what could be best described as prosumer and professional level printers. If you’re looking to print in exotic materials for professional applications then Rokit’s offerings may appeal to you. Rokit reports that they have 50% of the South Korean 3D printer market and now sell their printers in more than 20 countries around the world. They started selling their 3Dison printers through their US distributor, CadQal Development Inc., about 6 months ago. On display at their booth at Inside 3D Printing Conference and Expo New York was their 3Dison PRO AEP (which stands for Advanced Engineering Plastic) 3D printer. Rokit markets the AEP as the world’s first desktop 3D printer capable of printing high-strength and heat-resistant engineering plastic, something that was previous only possible with very expensive industrial printers. The AEP can print a variety of materials including ULTEM resin grade 9085, which is heat resistant to 173°C, has high electrical insulation, abrasion resistance and impact strength and can be sterilized for use as food containers or for medical applications. ULTEM has incredible tensile strength; 7 times that of lead, double of high density polyethylene, 0.3 times of cast iron for mold making, 25 times concrete, 5 times of rubber and double the tensile strength of wood. Other engineering grade plastics that can be printed on the AEP include PolyCarbonate plastic and PEEK. The AEP has a large build volume of 11.4″ x 8.1″ x 9.6″. It has a fully enclosed heated build chamber, heated bed, one-touch auto bed leveling, can print down to 25 microns and can be controlled remotely through WiFi. The AEP can print at high speed, up to 1000 mm/sec. The 3Dison Pro AEP retails for $11,950. Rokit was also displaying their newest printer, the Rokit Stealth 300. The Stealth is also capable of printing at 25 microns. It can print in 3 different materials or colors during a print with its unique 3-in-1 extruder. That’s right, it can print 3 colors or materials out of a single extruder! The Stealth is WiFi-enabled for remote printing and comes with a build-in video camera for remote viewing of the print. Having seen it in person, I can say that the 7″ full color touchscreen is also quite impressive and you can see live video of the build chamber on the screen. The Stealth has auto leveling, an auto cleaning function and automatic filament detection to pause a print when it runs out of filament. The Rokit Stealth has a build volume of 11.4″ x 7″ x 7.8″, price to be announced. Recently we reported that Rokit was releasing a desktop bio printer, the 3Dison Invivo. 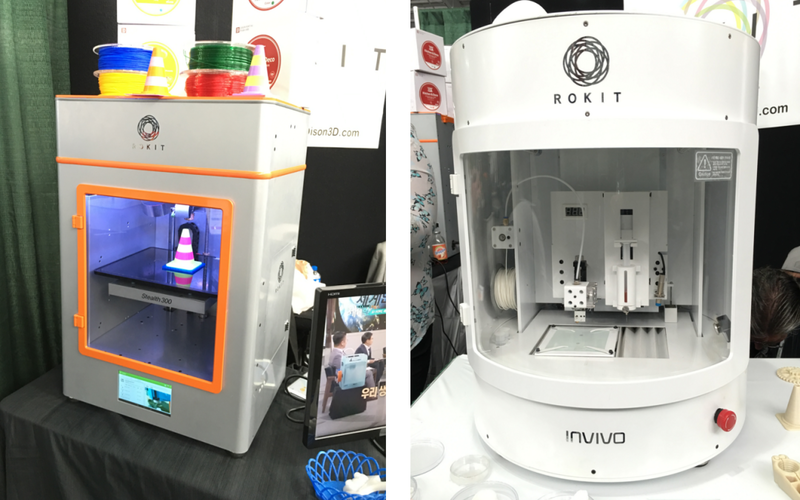 At the Inside 3D Printing Conference and Expo the newly rebranded Rokit Invivo was on display. It’s pretty incredible, a desktop bio printer. The Invivo prints has both an extruder and a liquid dispenser for printing in medical grade filaments and bio ink. The printer at the show was loaded with a filament made from the same stuff used for internal suturing, ostensibly to be used as a scaffolding for bio ink printing that could be absorbed by the human body, leaving just the bio ink print behind. Among the materials available for printing on the Invivio are medical grade copolymers PLGA (poly lactic-co-glycolic acid), PCL (poly caprolactone), and PLLA (poly l-lactide) through the extruder and collagen, gelatin, silk fibroin and hyaluronic acid as a hydro gel bio ink. The Rokit Invivo comes with a HEPA filter (H14) and UV sterilization device. The extruder has XYZ resolution of 1.5 microns though a 4 micron stainless steel nozzle, and the bio ink pump can also print at 1.5 microns with various sized nozzles ranging from 8 microns down to a 1.5 micron nozzle. The Invivo uses FDA approved parts to protect against material contamination. It also features an LCD touchscreen, video camera, a separate internal thermometer display, sterilizing UV lamp and an emergency stop button. The Invivo Premium adds an air pressure dispenser, cooling and heating bed that can go from -30°C to 80°C and a bio ink pump with a 1 micron nozzle. The build volume for the Invivo Standard and Invivo Premium are 4″ x 4″ x4.7″ and print speed is from 5-100 mm/sec. Prices start at around $26K. Rokit was also promoting two new filaments. Their Kitchen & Deco material is FDA food contact compliant and is BPA free (BPA is an environmental hormone liked to adolescent brain damage, early-onset puberty and breast cancer). It can be used for printing kitchen supplies, cups, bowls and other food containers, and comes in various colors. It prints at 265°C and should be printed on a heated bed set at 90°C. Thermal deformation temperature is 20°C higher than PLA, but it should not be used in the microwave or placed near a direct heat source. Items made with Kitchen & Deco filament can be washed and reused and safely holds coffee, tea or food. Rokit’s Skinflex filament has similar properties to Ninjaflex or TPU, but is FDA food contact compliant and BPA free, like Kitchen & Deco filament. It is safe for skin contact, making it ideal for wearable devices, props, clothes or daily supplies. Skin flex is the only flexible filament that doesn’t emit chemicals or endocrine-disrupting environmental hormones. Printing temperature is 245°C and doesn’t require a heated bed. How do 3D Printed Dentures Stack up when Compared to Milled and Injection Molded Dentures?